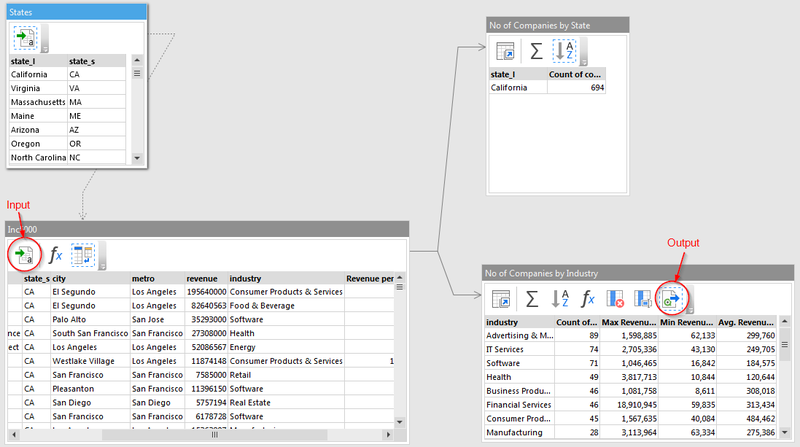 We've added one more demo -- an example of QlikView Integration. It shows how data transformation logic can be moved from a QlikView loading script into an EasyMorph project, where it can be visually designed, modified and viewed. While it doesn't replace the loading script completely (yet) it demonstrates how core transformation logic can be made accessible for non-technical users, who can now explore and modify the logic in a visual way, without dealing with the script syntax. The example is based on another EasyMorph demo -- Inc5000 with added export to QVD. Here is its transformation logic. Input and output transformations are marked on the screenshot below (click to zoom). Since EasyMorph can't process a list of files yet (this feature will be added in future releases) a simple workaround is used -- a cycle, that iterates through a list of file names, and renaming. For convenience the EasyMorph project can be opened right from desktop QlikView (there is a button for this in the example). For server execution, you might need to specify the path to EasyMorph executable explicitly, since EasyMorph is usually installed under a user account and may not be available in the registry under QlikView Server's account. While it's not shown in the example, you can also add a link to the HTML documentation automatically generated by EasyMorph when it runs a project with /doc parameter from command line (see help on this). In this case users will be able to see the documentation right in the web-browser, next to the application. Or, right in the application, using an extension for web page embedding.